As the Internet explodes in all-out hysteria over the image of Michael Jordan wearing a co-branded Supreme x Jordan t-shirt, we&apos;re learning something new about the Air Jordan V release that you should definitely know. 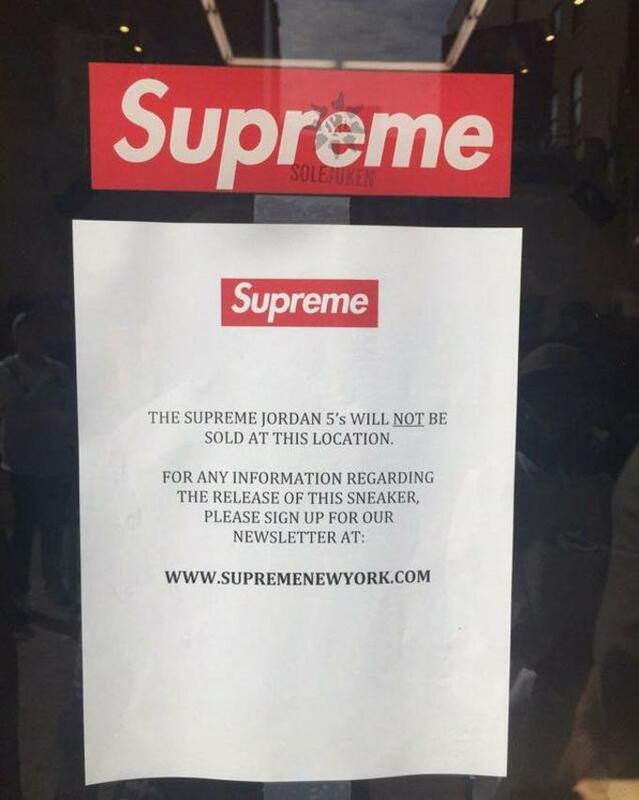 An image from @solejuken, pictured below, shows a note on Supreme&apos;s Lafayette Street NYC location that says the Jordan V collaboration will not be sold in store. It then instructs customers to sign up for its newsletter for more information on the release. We reached out to the New York location and can confirm that this is accurate, however the Los Angeles, Calif., location was not open for comment at the time of publication. As you may remember, Supreme was forced to cancel the in-store release of its Nike Foamposite collaboration last April due to extremely unruly and aggressive crowds. Instead, the sneakers were sold exclusively online, which will likely be the case with these Jordan Vs, however we&apos;ll update you if anything changes. For now, it&apos;s probably be a good idea to stop camping outside of the store and start camping in front of your laptop for more info.